A hint with this is; The radius of a circle, will divide it’s own circumference into six, well nearly, roughly . . . there-abouts anyway! So if one gap between circles ends up being a bit wider than the others it’s OK. We deliberately planned our layout to provide a little more width for the main access pathway into the middle of the mandala and pond. Hammer in a peg in the centre of each circle bed, and mark out the individual circle outlines of the beds. In our case, we used ‘lime’ to mark the circles, but you can use flour. Then compost up the beds adding horse poo and peanut mulch, plant some buck wheat, cover with mulch hay. Water the bed a plenty and let it settle & the buckwheat shoot and grow a bit, then it’s ready for Chook Dome to move on to it. Freshen the mulch and plant vegie seedlings straight after the dome moves to next bed. The Chook Dome moves around the two Mandalas (set of circles) in a figure 8 pattern, spending 2 weeks on each bed. This equates to one complete circuit every 6 months. Clockwise on the first Mandala (pic below) and anticlockwise on the second Mandala still in layout (pic below that). 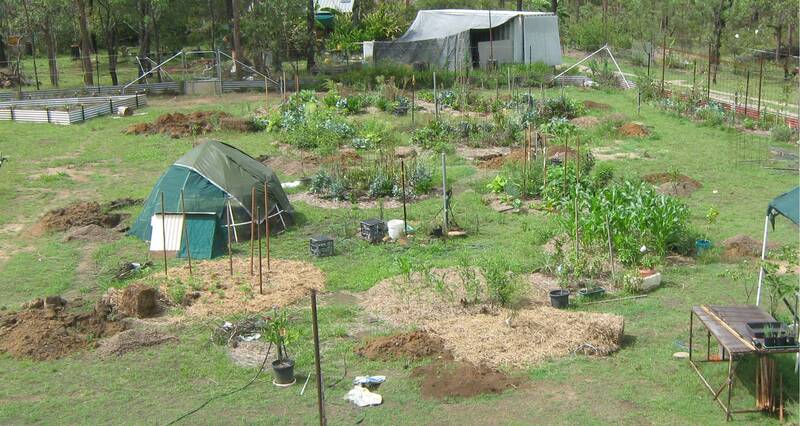 Note; Chook Dome sites are only the outside circles, the centre circle is for a pond and perennial herb beds. The pic below shows the marking out of Mandala 2. 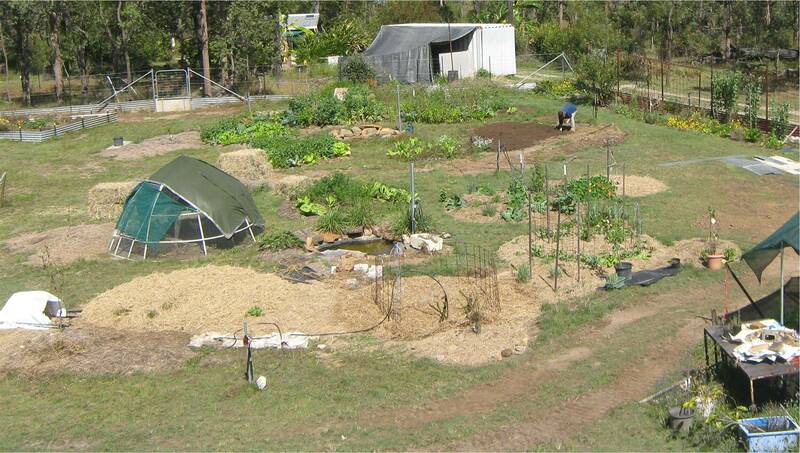 The photo below is Nov 2013, and shows garden after the dome has done one complete figure 8 lap, Still planting fruit trees. Notice the broody coop alongside the dome. We had a hen in there sitting on eggs which hatched in Dec 2013. Below is what the garden circular layout looks like when it’s working and the dome has done two full figure 8 laps. It is July 2014. It took longer than 6 months for a rotation, probably because the year’s seasonal changes dictated to us, and we stalled the dome on higher ground longer than we should have during the wet season. Also notice the pond in the centre circle is completed and plants developing. More of the mandala areas are becoming defined with mulch and plantings of ground covers. Herb areas and perennial beds in between the circle beds are mulched and being developed during this lap. Development of the area is constant, filling in convenient positions with useful plants. Categories: Building & Planning, Gardening | Permalink.